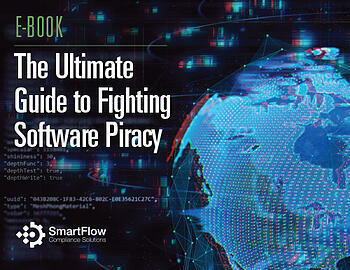 This e-book is the definitive guide on how to address the global software piracy problem. 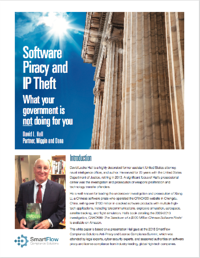 In this e-book the world’s leading license compliance managers, intellectual property experts, and commercial litigation attorneys share their best practices for protecting your software company from piracy and under compliance, as well as remedies for recovering losses once you have identified infringing organizations.. There are fundamental differences in values, behaviors, and attitudes that are expressed in cultures worldwide, and these have a significant impact on decision-making processes in business situations between different countries. 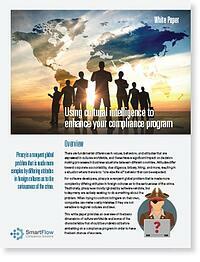 When trying to confront infringers on their own, companies can make costly mistakes if they are not sensitive to regional cultures and laws. Many people think the U.S. government is fervently using law enforcement and national security resource to protect citizens and companies from cyber threats and IP theft. This is not true. This white paper will help you understand what the government is NOT doing for you and how you can protect yourself. 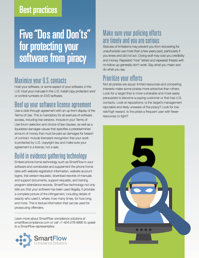 Useful information on piracy, copyright infringement, malware, counterfeit software, and more information from our valued partners. The Business Software Association's latest software survey, conducted in partnership with International Data Corporation, attempts to quantify the volume and value of unlicensed software installed on PCs across more than 110 national and regional economies. The results show that although chief information officers are aware that using unlicensed software creates security risks, 37 percent of software installed on PCs is still unlicensed. The report thus makes clear that in this era of heightened cybersecurity risk, organizations need to take the critical first step of assessing what is in their network and eliminating unlicensed software. In doing so, they can reduce the risk of harmful cyber attacks and boost the bottom line. Wiggin and Dana partner David L. Hall will be featured on the CNN program "Declassified" on Saturday, September 2 at 9 p.m. The episode focuses on Hall's book, CRACK99 detailing his Chinese cyber piracy investigation and prosecution as a federal prosecutor. In 2013, the Commission on the Theft of American Intellectual Property released a report detailing the enormity of the issue of intellectual property (IP) theft in the United States and made recommendations for combatting the problem. The commission is an independent bipartisan initiative of American leaders from the private sector, national security, foreign affairs, academia, and politics with three purposes: document and assess the causes and scale of international IP theft as they affect the U.S., document and assess the role of China and other infringers, and propose policy responses to mitigate the damage of IP theft, as well as obtain greater enforcement of IP rights by China and other infringers. Earlier this month the European Commission adopted the Privacy Shield, the new EU-approved mechanism for the transatlantic transfer of personal data, replacing the now defunct Safe Harbor scheme. This article provides practical guidance for organizations considering self-certifying under the new framework. This 2013 white paper by IDC and Microsoft discusses how pirated software can compromise the cybersecurity of consumers, enterprises, and nations... and the resultant costs in time and money. This study demonstrates that IP theft harms not just the owners, but also the entire U.S. economy. Far too many manufacturers in emerging markets use these practices as a means to compete unfairly with law-abiding manufacturers, costing the U.S. economy jobs, industry revenue and GDP. In a newly-released 2017 update to the original report, the commission provides a new assessment of the problem and examines the progress that has been made on the original 2013 report recommendations. The report covers new developments in government attempts to counter IP theft, updated figures on damages from IP theft, and the state of IP regulations and protections abroad. Chinese company Sino Legend Chemical Co. was unsuccessful on Jan. 9 in persuading the U.S. Supreme Court to hear its case questioning the ITC's authority to ban importation of its products to the U.S. for 10 years after having found the company stole trade secrets from a U.S. competitor. BSA’s Global Software Survey conducted in partnership with IDC, estimates the volume and value of unlicensed software installed on personal computers in 2015, across more than 110 national and regional economies. It also reveals key attitudes and behaviors related to software licensing, intellectual property, and emerging technologies based on a global survey of more than 24,000 respondents. This report is focused on the most prolific cyber espionage group Mandiant tracks: APT1. This single organization has conducted a cyber espionage campaign against a broad range of victims since at least 2006.